The Patterdale Terrier, also known as the Black Fell Terrier, is an extremely hardy, working-class animal. Originally bred in northern England to be a hunting dog, the Patterdale is intelligent, loyal, and independent, and is known for its excellent health. This breed is devoted to its family, but is happiest when it is roaming the woods searching for small animals upon which to prey. Ideally, the owner will be an experienced dog owner, with a large yard or living area (as well as a large amount of patience for training)! The Patterdale Terrier, a member of the Terrier group of breeds, was developed in England in the late nineteenth century to be an agile, durable hunting dog. These athletic little guys are great field companions, of course, but they also make good pets for active singles or busy families. A few facts about the Patterdale Terrier: they're small-sized, with short coats in black or assorted shades of red, and resemble a miniature Labrador Retriever. This breed is small-sized, but solid. Height varies from 10 to 20 inches at the shoulder; weight, 11-18 pounds. Patterdales are independent, loyal to their owners, bold, and inquisitive. They were originally bred to be hunting dogs, so they exhibit a no-nonsense, “working-class” temperament. If socialized with children and other dogs while a Patterdale is a puppy, it will learn proper behavior; as an adult, this breed’s introduction to others may be a bit problematic. And since it has a very strong prey drive, a Patterdale will not mix well with smaller pets (including cats). These dogs are very affectionate with their human families; of which they consider themselves part of the "pack". An extremely low-maintenance breed. Patterdales are known for their outstanding health and low shedding frequency; as high-energy animals, these dogs will require a great deal of exercise, preferably in the woods or an open field. Training is not for the faint hearted so these dogs are recommended for the experienced owner. The Patterdale Terrier originated in the Lake District of northern England, in a hilly area called the Fells. 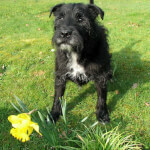 The breed is descended from the Fell Terrier, which has existed in the same region since as early as the 16th century. During the late 1800s, one of the noted dog breeding organizations in the Lake District was Ullswater Kennels, which was run by a famed English sportsman named Joe Bowman. At some point during his tenure as kennel master, Bowman began cross-breeding Fell Terriers with blue/black Border Terriers; he named the new breed the Patterdale Terrier in honor of the Patterdale Hunt Club, which often utilized Ullswater Kennels during that time. 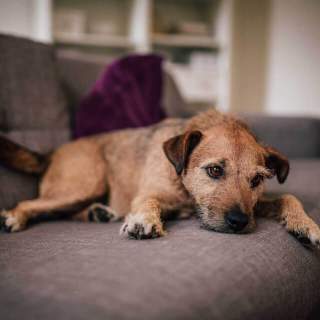 This selective breeding continued through the years, and starting in the 1940s the Patterdale Terrier emerged as a breed all its own, mainly due to the efforts of English dog breeders Cyril Breay and Frank Buck. 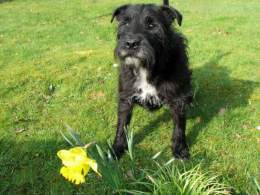 Apparently, the two men desired a black, shorter-haired breed that would have the stamina to endure long days of hunting in the nearby Fells, so Breay began breeding his longer-haired Patterdale dogs with Buck’s black, shorter-haired Border Terriers; eventually their hereditary lines condensed and created the Patterdale Terrier that was more representative of the breed as we know it today. Another English breeder, Brian Nuttal, continued refining the Patterdale hereditary line in the 1950s, and it is believed that all Patterdale Terriers since have originated from Nuttal’s kennels. Patterdales began being imported to the U.S. in the 1970s, and today this breed is highly prized for its small-game hunting skills. Compact and strong, this breed has a length usually a bit greater than its height. A Patterdale’s most distinctive feature is its powerful wedge-shaped head. Ears are moderate in size, triangular, and forward-facing; eyes are wide-set and intelligent. The thick coat, part of the dog’s breeding to withstand long days spent outdoors, can be either smooth or broken (also called “wiry”). 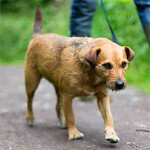 As part of its working terrier breeding, a Patterdale has an extremely athletic build, with strong, straight forelegs, a level back, and muscular, arched loin. The tail is of medium length, straight, and is sometimes docked. An overwhelming majority of Patterdales are black, but they can also be red, black/tan, chocolate, liver, and bronze. A few dogs of this breed, regardless of color, have white markings on the feet and chest. This is a small-size breed; because of differences in breeding methods, Patterdale Terriers may vary quite a bit in size. Normal weight ranges from 11 to 18 pounds; height, 10 to 20 inches at the shoulder. Smooth: Glossy and short in length, smooth-haired Patterdale Terriers still have double-layered fur. Broken: Also known as "wire-haired," these Patterdales have coarser fur, and might have some excess facial hair. 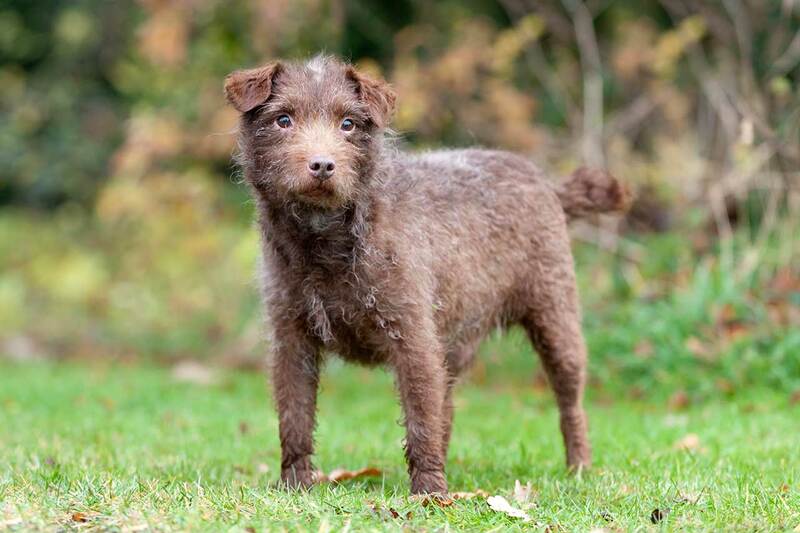 Rough: These medium- to long-haired Patterdale Terriers have very dense double coats, and a good amount of hair on the face and ears. This coat variety is most often seen in areas with colder climates. The size of these dogs can also vary a good bit, even though there are no specific sub-types. Due to differences in size in the lineage of different Patterdales, one dog of this breed can be as small as 10 inches in height and 10 pounds in weight, while another may be 20 inches in height and close to 20 pounds in weight. 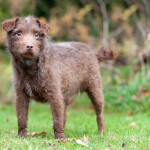 Miniature Patterdale Terriers do exist, but are rare; they are simply extremely small dogs (usually the runt of a litter), and again, are not considered a sub-type of the breed. Patterdales are confident, bold, intelligent, and independent dogs. Although friendly, loyal to their owners, and often sociable, Patterdales are bred to be working animals, and thus will exhibit no-nonsense, goal-oriented behavior. The breed has a strong prey drive and a high-energy temperament, so it will be happiest when it is outdoors, with room to run freely. Due to their confidence and instinct for boldness, this breed is protective, and makes an excellent watchdog, partly because of its loud bark. When indoors, a Patterdale will enjoy attention and display affection towards its owners, but these dogs require a good bit of “outside time.” This breed may become bored if left alone indoors for extended periods of time, which could lead to destructive behavior like hole-digging and tearing of furniture. For this reason, Patterdales are recommended only for experienced dog owners. Because of its instincts for independence, this breed can be a bit difficult to train; the inexperienced owner may opt to have their pet trained by a professional. Some Patterdales may incur Small Dog Syndrome (SDS), in which they develop undesired habits like aggression (especially towards larger dogs), overt selfishness, and inconsistent behavior such as begging for food and urinating in odd places. According to experts, this SDS behavior can be minimized with consistent training, often with a professional trainer, to help the dog learn its place in the family "pack". One interesting characteristic of this breed is that it has a unique “belly crawl” that it performs regularly; this is assumed to be instinctual, as Patterdales often go to ground when hunting in order to chase small prey through tunnels. Patterdales are moderately good with children. If socialized with kids as a puppy, this breed will usually make an excellent companion, and will especially enjoy playing outdoor games like fetch, tag, and even football. 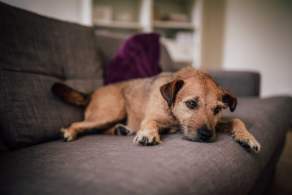 If introduced to children as an adult, a Patterdale’s independent nature may take over, and while it won’t be aggressive to kids, it may be standoffish. Patterdales have an extremely high prey drive, so they may chase smaller animals (including cats), especially when outdoors. They will tolerate other dogs fairly well, but may tend towards dominant behavior, especially with larger dogs. Regardless of the type of animal, early socialization with other pets is highly recommended for this breed. Though independent, these dogs are very loyal to their owners, and will be protective of them by often barking loudly around strangers, though they usually aren’t aggressive. Many Patterdales will follow the lead of their handlers, and treat unknown people the same way their “humans” do. Below are pictures and images of the Patterdale Terrier dog breed. Patterdales need very little in the way of maintenance. Their double coats – whether smooth (short length) or broken (medium length) – do not shed much, so little cleanup will be necessary. And Patterdales are extremely healthy and hardy, so veterinarian visits will be rare. 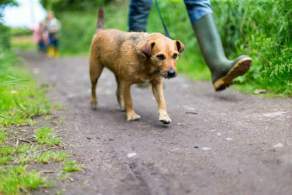 This breed will require a great deal of exercise; a daily scamper through the woods is ideal. Training is also not for the inexperienced owner as this breed can come across stubborn and dominant; if you insist on this breed as a first pet, you may benefit from professional training for your Patterdale. This breed’s fur is either smooth, with short hair, or broken (wiry) with medium-length hair. Neither coat sheds much at all, so the occasional brushing will suffice. As high-energy, rambunctious dogs, Patterdales tend to get dirty more quickly than some other breeds, so a bath every 4-6 weeks is recommended. This breed’s nails grow fairly quickly, and will need to be trimmed about once per month. Plenty of exercise is a requirement for this breed. Since they were bred as hunting dogs, Patterdales prefer areas with lots of room to run and explore; if this is not possible, a long daily walk (or jog) is highly recommended. If walking a Patterdale, experts recommend using a leash, and the dog should be made to heel to encourage proper discipline. Patterdales are recommended for homes with nice-sized yards that allow the dog plenty of running room. This breed is not suited for apartment living; Patterdales bore easily, especially when left alone, leading them to exhibit noisy, destructive behavior. As healthy, robust animals, Patterdales tolerate both hot and cold weather with equal ease. Since they are high-energy dogs, be sure they are provided plenty of water, no matter the temperature. This breed is prized for its extremely good health. One known minor health issue is conjunctivitis, caused by dirt and debris becoming stuck in a dog’s eye. A quick remedy for this is flushing the dog’s eye with salt water twice a day; if the problem persists, see a veterinarian.